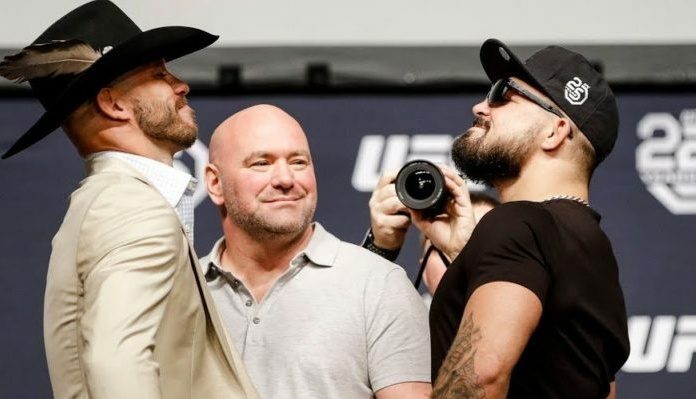 A welterweight fight between dangerous strikers Donald Cerrone and Mike Perry co-headlined tonight’s UFC Fight Night 139 even in Denver. Donald Cerrone (33-11 MMA) entered tonight’s contest looking to rebound, this after suffering a unanimous decision loss to surging welterweight contender Leon Edwards at June’s UFC Fight Night event in Singapore. Prior to the setback, “Cowboy” was coming off a spectacular first-round finish of Hawaiian Yancy Medeiros. As for “Platinum”, Mike Perry entered tonight’s contest having most recently competed at July’s UFC 226 event, where he earned a split-decision victory over Paul Felder. Mike Perry started off tonight’s fight aggressively and actually ended up scoring a takedown on Donald Cerrone. However, much to the pleasure of the Denver crowd, “Cowboy” was able to reverse the position and eventually locked in an armbar submission which forced “Platinum” to tapout. Atta boy @Cowboycerrone jumped out my seat! Following tonight’s win, Donald Cerrone declared that he will be returning to lightweight and is coming for current title holder Khabib Nurmagomedov.